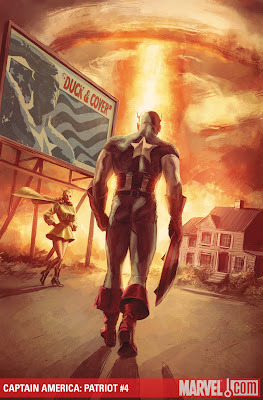 MARVEL COVER OF THE MONTH: Captain America: Patriot #4 by Mitch Breitweiser. There's something haunting about Cap walking towards an atom-bomb blast, shield lowered that makes you stop. 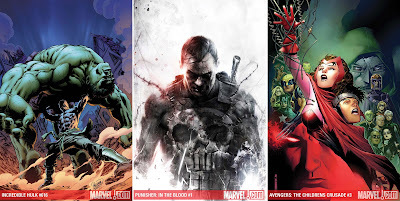 CLOSE CONTENDERS: Carlo Pagulayan - Incredible Hulk #616, Francesco Mattina - Punisher: In The Blood #1, and Jim Cheung - Avengers: The Children's Crusade #3 (Just look at that Vision!). For the full Marvel November range, click the jump. Hard ot go wrong with a Jim Cheung cover. . . I know what you're saying Doug - it's now my work computer Laptop. Right nice one it is too. Just the change in how he draws the Scarlet Witch from when he jumped aboard Force Works so many years ago shows how far he has come. He was good back then, now he's... well, amazing. That Punisher cover is fantastic! Long live the Punisher! Yip - Punisher sure sits well on a cover Jonny! HA! You know David I never saw Janet Jackson in that image before, but now - yip - you're right!